December at Stacked brings all new flavors and tasty treats. You could even say they make "Food Well Built". Since every month brings new menus, I like to try a variety of food when I am invited to media tastings. 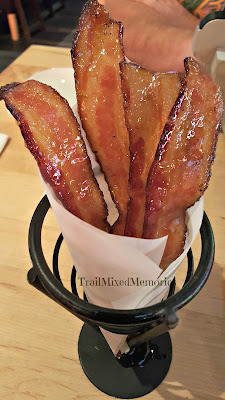 This month's lunch date with my hubby had us starting off with our favorite, Candied Bacon. This melt in your mouth delicacy is sure to please almost anyone! I am sure this appetizer alone is the reason I am not a vegetarian. LOL Soaked in maple syrup, it is cooked to perfection. 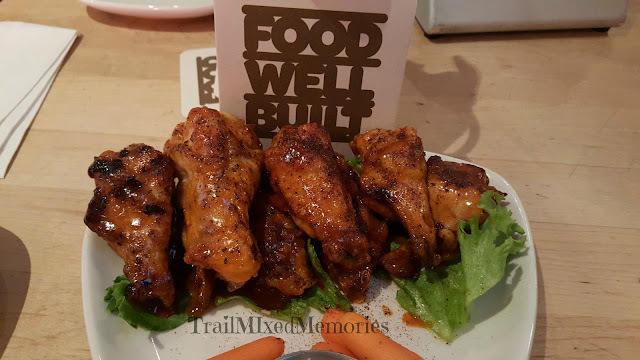 The second appetizer was the Sweet Chili Wings. 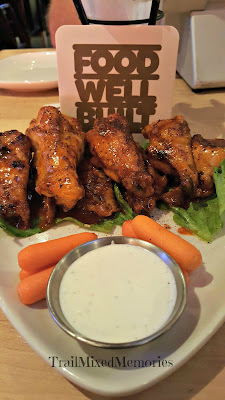 Do you like a sweet and spicy start to your meal or just eating wings on its own? These were too spicy for my children but hubby and I were fans. This would make a great Football Party treat. 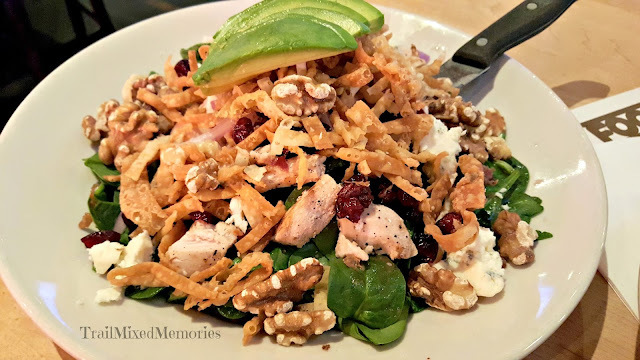 On the new menu, a Cranberry Chicken Salad stood out. I am a big fan of fruit and nuts salads so I couldn't pass it up. I am lucky I tried it! Yumm! I had added crunchy wonton bits for an additional crunch. The Basalmic vinegar dressing blended well with the bacon and bleu-cheese. Known for their Mac N Cheese, I felt that the Surf and Turf dish was a sure deal. 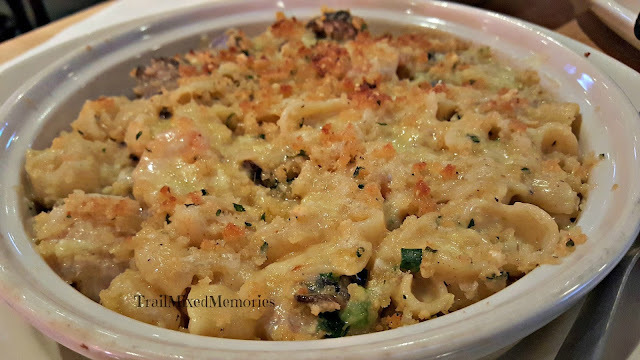 With Steak and Shrimp, I added sauteed mushrooms and extra Parmesan on top to add even more of an Italian kick. The mushrooms were a perfect partner for the surf and turf. 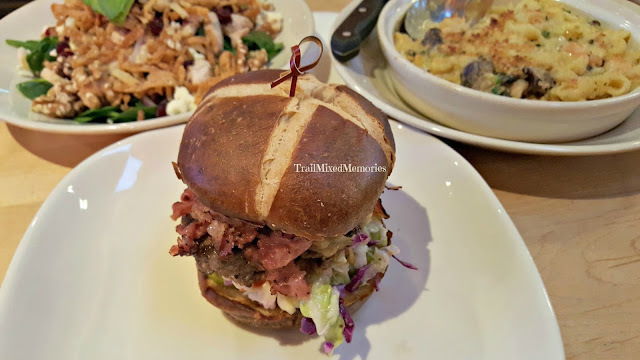 My hubby chose the Pastrami sandwich was on a pretzel bun with cole slaw and brown mustard. Bring your appetite! This burger was so big we brought half of it home. I am not a fan of pastrami but I was assured it was a must have. I am not sure how it had happened but I have never tried Bread Pudding. I really wasn't even sure what it was... Is it a pudding? Bread? The wait was over. The Stacked holiday dessert was a make your own Bread Pudding. How do you make something you have never had? I chose my favorite flavors. I added coconut, chocolate, whipped cream, and almonds. It tasted like an Almond Joy. The texture of the combination may take a bit to get used to but I might give it a second shot. 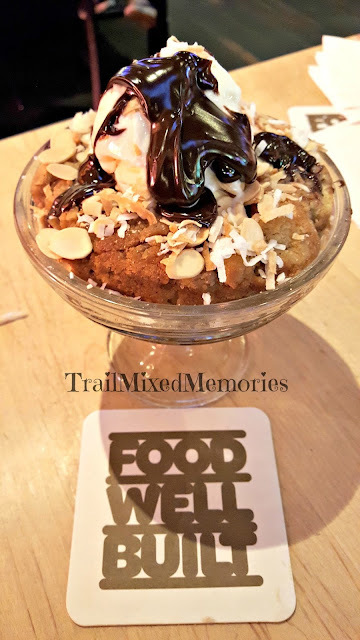 I have enjoyed trying the various menus of Stacked and I hope that I could take the guesswork of where to go for your next date with Hubby. DISCLAIMER: I was invited to try new menu items to share my opinions. All thoughts and ideas are my own. Do not use any photos without permission.